Made of stainless steel of 1.2mm thickness (AISI 304 2 D) which by far is the most recognised material for it's excellent anti-corrosive properties within atmosphere and water. It carries a five (5) years warranty against leakage due to manufacturer's fault. Made of anti-rust coated cold rolled mild steel of 2mm thickness and incorporated with Magnesium Anode in it's design to provide an around-theclock protection against corrosion. It carries a three (3) years warraty against leakage due to manufacturer's fault. Made with magnesium alloy and when the anode is electrically connected to the structure to protect, it makes more negative the electrochemcal potential than the structure itself. In this way the structure acts as the cathode and the magnesium alloy rod as the anode (therefore, the name magnesium anode). It is used to protect metallic structures that are in contact with water against corrosion. 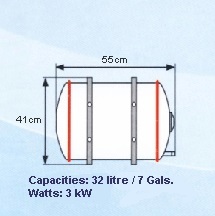 To sense and to monitor the temperature of water in the inner tank between 40° C- 70° C approximately. Besides, it is equiped with a Bimetallic Thermal cut-off device, also called th third safety, which will be activated to cut off electricity supply should there be any malfunction of the thermostat. It has dual functions, one is to guard against excessive pressure built-up in the inner tank above 7.58 bar (11Dpsi), the other is to prevent water from the inner tank to flow back. Both Elton and Ignis water heaters have a wide selection of standard capacities of between 3 gallons - 33 gallons to cater to individual requirements. We can also manufacture according to customers' requirements (tailor-made) to meet specific needs and applications both for domestic and commercial purposes. Both Elton and Ignis water heaters, irrespective of capacities, can be easilly installated, whether wall-mounting or floor-mounting, vertical or horizontal version. Its unique design totally eliminates the need for vent pipes. Both Elton and Ignis water heaters are stored under pressure, the flow of hot water can be diverted to either single or multiple outlets or at different levels. Being an established manufacturer 1960's, we are responsible and committed to after-sales service as we realize a product especially electric water heater need not only to meet up with buyers' expectation in quality and safety, the after-sales service is equally, if not more important. Our team of experienced technician is always ready to be on call to serve our customers. This is our commitment. 1. Electrical parts cany a one (1) year warranty against manufacture' s defects. 2. All the above important component parts are fully imported. Pipe Size : (1) 15mm (½") dia. Stainless Steel pipe for Stainless Steel inner tank. (2) 15mm (½") dia. Mild Steel pipe for Mild Steel inner tank. Water Temperature : Themostatically controlled between 40°C - 70°C approximately. Max. preset temperature at 70°C. Thermal cut-off (Third safety) : Bellow 99°C - manually resetable. Inner Tank : (1) Stainless steel AISI 304 2D of 1.2mm thickness. (2) Cold rolled steel JIS G3141 of 2.0mm thickness. Outer Casing : Cold rolled steel JIS G3141 of 0.7mm thickness coated with electrostatic epoxy powder.